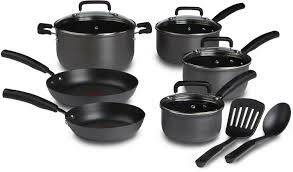 Non-Stick/Teflon (and other similar brands) are the ones with the black smooth coating. They are also on the non-stick coatings of appliances such as sandwich makers, non-stick grills, waffle makers, etc. These non-stick coatings have two big problems 1) the toxic fumes they emit when heated, and 2) the little black bits that leach into your food once the surface starts scratching, wearing down and chipping away. 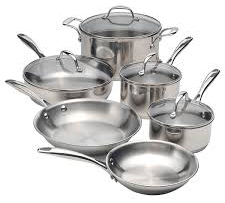 Non-stick cookware is made using a cancer-causing chemical called perfluorooctanoic acid (PFOA, also known as C8), which starts emitting toxic fumes of at least six toxic gases within five minutes every time you cook with a non-stick pot or pan. These gases are emitted using normal cooking temperatures too such as frying bacon or pre-heating pans to make pancakes, where temperatures often reach 536°F/280° C.
Inhaling PFOA is suspected to cause 1) cancers such as prostate, cervical, uterine, non-Hodgkin’s, leukaemia and multiple myeloma, 2) raised risk of birth defects, 3) ‘Teflon flu’ or ‘polymer fume fever’ where chemicals penetrate the lungs and cause a flu-like illness (plus these fumes can kill your pet bird in seconds), 4) serious changes and toxicity in organs including the brain, prostate, liver, thyroid, and kidneys, 5) higher than normal cholesterol levels. According to Dr Mercola, ‘The chemical (PFOA) is also extremely hardy in that it stays in the human body for years. According to EWG (Environmental Working Group), even if all new exposures to PFOA were stopped, it would still take 4.4 years for your body to get rid of half of he PFOA that’s accumulated in your organs and tissues’. Scary or what? I just don’t think they’re worth the risk. The worn down, chipped non-stock coatings release even more toxic chemicals and gases. There’s new debate about the little black flakes chipping off into your food, and hence into your body. Some experts say these black flakes are carcinogens, others say they can pass through your body unabsorbed. I prefer not to take the risk! Besides exposure to these gases (and flakes) after being scratched they lose their non-stick qualities anyway. When I had my non-stick pans I remember it wasn’t very long before they started breaking down (within a few weeks of buying them despite only using plastic utensils and using gentle heat), which leads me to ask why I even bothered in the first place? I’m a real sucker for good marketing, that’s why… Sigh. After they were scratched they were just like any other ‘non non-stick pan’ to clean as well. Grumble. I’m a work in progress! These are the reasons why I threw out my old teflon coated pans, and replaced them with safer options. S0, what are the safer options? These beautiful pans are best known by the very expensive Le Creuset brand (however much cheaper options are readily available these days). They are heavy based and retain heat for a long time and are magnificent for cooking things like curries, casseroles,and roasted meals in the oven. They work on the stove top or in the oven. To Clean: Don’t throw cold water into a hot pan! Let the pan cool down, and then clean with warm/hot soapy water. Rinse and dry. Any stubborn food residue can be removed by soaking for 15-20 minutes, or by using a plastic scourer. These pans can be put in the dishwasher though this dulls the enamel over time. I remember my grandpa used one of these to fry an egg every single day! Cast iron pans have a long history dating back many centuries. Back in the 70’s when teflon pans came into vogue these old fashioned pans fell out of favour. They were basic looking and heavy to use and the handles could get too hot to handle. With seasoning (and use) cast iron pans develop a non-stick surface which is part of their magic. They also can withstand and maintain high cooking temperatures, are slow heat conductors, and an excellent choice for searing or frying. From a health perspective cast iron pans can leach dietary iron into food. Highly acidic foods like tomato sauce can strip the seasoned non-stick coating and if you do cook tomato dishes (and high lemon juice dishes, vinegar etc) you’ll need to re-season the pan. To Clean: The key to cleaning a cast iron pan is to maintain the seasoning. They can be simply wiped out (if there is only oily residue), or you can use hot water and a stiff brush, or you can use mild soap and water, dry immediately – then apply a thin coat of oil (I use about a teaspoon of olive oil and a paper towel). Definitely do not put in the dishwasher, and do not use excessive detergent or heavy scouring. Stainless steel is highly durable, and designed to distribute heat evenly throughout the cooking surface helping maintain a constant temperature, it is also an excellent heat conductor. Lids form a tight seal on the pots therefore cooking vegetables, rice, and sauces are easy. Stainless steel tolerates high heat so searing and frying are also easily achieved. In addition these pans are strong and highly resistant to scratches and dents. The smooth surface of stainless steel is easily cleaned, and prohibits the absorption of odours and tastes so these pans are great for use between different styles of dishes where previous flavours may be unwelcome (ie. last night’s oily garlic sauce and this morning’s oats for breakfast!). These pans can last a lifetime too so they are a sound investment. To Clean: Use hot soapy water. They are dishwasher safe. You can scrub vigorously without fear of harming the surface. If a cooking mishap occurs you can leave to soak and most residue will simply fall off with a gentle wipe. For more sinister burns (thank you to the last time I cooked chickpea curry and got caught up in a game of candy crush) steel wool does a great job. They can be air-dried. Blue steel, carbon steel, black steel; all different names for the same thing. These pans are much lighter than cast iron pans. Oh, and cheap to buy too (though a little more specialist to find – just try buying them ‘anywhere’ for all the teflon pans around hogging shelf space). Being raw steel they MUST be seasoned before use. 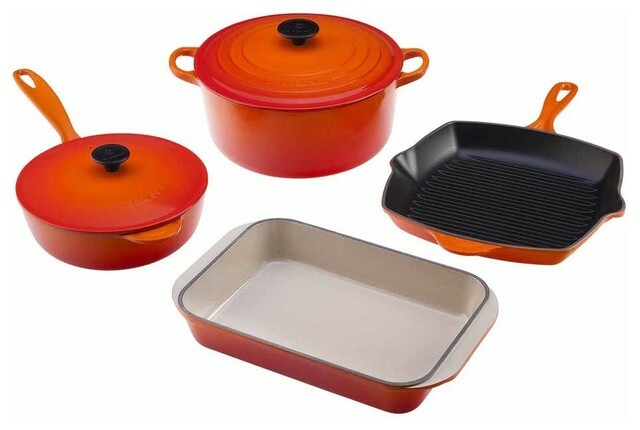 Seasoning protects from rust and provides a natural non-stick coating which gets better with use. These pans are great for pan roasting, sauteeing, stir frying, searing, frying, or cooking anything buttery or oily. Again, acidic foods (like tomato sauce) will strip the coating so save tomato sauces, lemon juices and vinegars for your stainless steel pans. 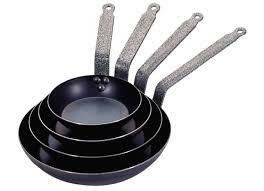 To Clean: Similar to cast iron pans the key to cleaning a blue steel pan is to maintain the seasoning. They can be simply wiped out (if there is only oily residue), or you can use hot water and a plastic scourer, or you can use mild soap and water, dry immediately – then apply a thin coat of oil (I use about a teaspoon of olive oil and a paper towel). Definitely do not put in the dishwasher, and do not use excessive detergent or heavy scouring. Also do not leave to air-dry as they will rust, and you definitely don’t want that! Are you planning to detox your kitchen? What are you planning to change? I’m going to get new pans- my non stick ones are chipping. Gross. Do you have stainless steal? Do you like them? Yes! I use stainless steel – as well as enamelled cast iron, and a couple of blue steel pans. Stainless steel is durable, easy to clean, it’ll last forever, and they look great. I use Scanpan, and the best part is you can easily find them on special for 30-40% off. I’d look in Myer, and General Trader, and compare prices (they often do packs with 2-5 pans). Don’t bother replacing your non-stick, no matter what they claim about safety, they don’t hold up to wear and tear and they’ll still emit gases and flakes. It’s not worth it!